Public speaking can be quite an intimidating task for those without much experience. Public speaking is not something everyone enjoys. In fact, it can be quite an intimidating task for those without much experience. Yet, chances are that at some point in your career you will be asked to deliver a speech or give a presentation. Before those instances occur, it can be useful to dedicate some time to training in the art of public speaking. In addition to the online training courses offered by MasteryTCN, the list below could help improve your public speaking skills. One of the key factors of a successful speech is that it’s relevant to the audience and they are able to relate to the speaker. Without understanding who your audience is and what motivates them, you won’t be able to achieve either of these goals. Take some time before the day of your event to learn what you can about your audience. You may even be able to get access to their demographics, which could help you tailor your words to better suit the situation. The old adage “practice makes perfect” still rings true. While you shouldn’t necessarily focus on being flawless, you should practice your words as many times as you can. Try different intonations, emphasize various parts of your speech and utilize varying hand gestures until you find the combination that works best. You can even include friends and family members in this part of the process. Ask them to sit in as your audience and work on engaging with them. They may have some useful advice for improvements at the end of the session. If you are giving a speech on a topic with which you are unfamiliar, use your preparation time to get to know the material. Speaking on a subject you know little about can add to your nerves and take away from your presentation. Study the area until you feel comfortable not only talking about it but also answering a variety of questions on the matter. Public speaking plays a major role in the modern workplace, so you should be prepared to hone your skills in that area. Nothing distracts listeners more than a fidgety, uncomfortable presenter. If you have confidence in what you are saying – and you should – then it needs to come across in your voice, body language and stage presence. When practicing, do so in front of a mirror and be mindful of things like your posture, eye contact, pacing and volume. The more confidence you display, the more receptive your audience is likely to be. Keep in mind that there is a fine line between appearing confident and coming off as arrogant. Shakespeare said it best when he stated, “Brevity is the soul of wit.” Audience attention spans will vary depending on the setting and subject, but the longer your speech is, the more likely you will lose audience engagement. The Reluctant Speakers Club suggested keeping speeches to 10 minutes or shorter. However, if you have to talk for longer, break each segment up in ten minute periods to keep the audience’s attention. Additionally, you should use varying sentence lengths in your speech to provide the listener with an interesting pattern to latch onto. 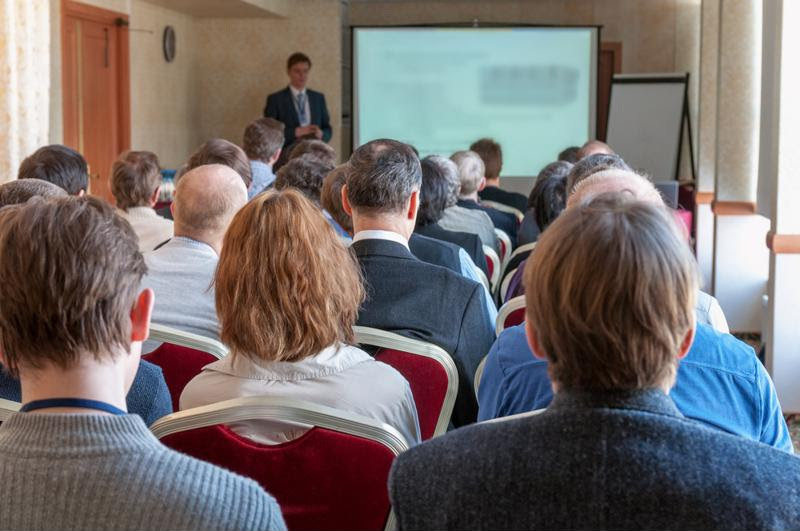 Few people can say that they are truly fond of public speaking, but it doesn’t have to be an activity you dread. By actively practicing to improve your public speaking skills and engaging with online training, you may find yourself volunteering for presentations and speeches. This entry was posted in Professional Development and tagged communication skills, communication training, online training, public speaking, training. Bookmark the permalink.